A computer model shows (a) actual rainfall in Houston during Hurricane Harvey, (b) simulated rainfall in an urban area, and (c) simulated rainfall in a non-urban area. Researchers confirmed that urban areas received more intense rainfall (darker blue areas) than non-urban areas. Houston’s urban landscape directly contributed to the torrential rainfall and deadly flooding experienced during Hurricane Harvey in August 2017, according to research by the University of Iowa and Princeton University. Overall, researchers found that Houston’s risk for extreme flooding during the hurricane—a category 4 storm that caused an estimated $125 billion in damage and killed 68 people—was 21 times greater due to urbanization. 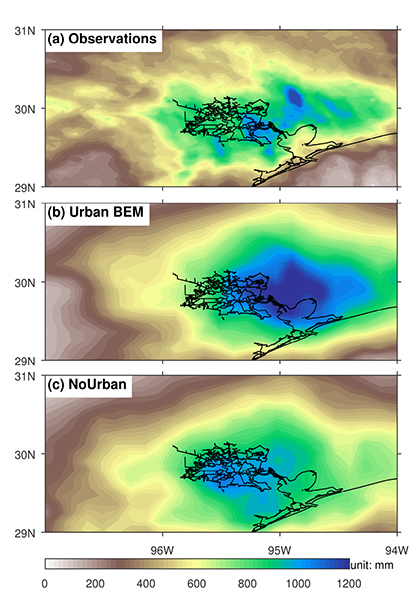 Using computer models and weather data, researchers recreated Hurricane Harvey and compared the total rainfall with urban buildup to total rainfall without urban buildup. Published Nov. 14 in the journal Nature, the results indicate that man-made development helped create a wetter hurricane—one that dropped 40 to 60 inches of rain over four days—as well as more serious flooding, with higher flood peaks and greater overall damage. The results of the study highlight the human role in extreme weather events, as well as the need to consider urban and suburban development when calculating hurricane risk and preparing for hurricane damage and recovery, the authors said. The study also accentuates the need to understand the compounded human impact on rainfall and flooding caused by urbanization and climate change. “Given that hurricane winds and rainfall are projected to intensify in the future, and that urbanization along our coasts is also expected to continue to increase, our work highlights the need to understand the risks and to implement appropriate flood-mitigation strategies,” said lead author Wei Zhang, an assistant research scientist at IIHR. In 2017, Hurricanes Harvey and Irma blasted the U.S. coasts with winds exceeding 130 mph, and Hurricane Maria rocked Puerto Rico with winds exceeding 155 mph. Together, the three hurricanes caused more than $200 billion in damage, a figure that makes the 2017 hurricane season one of the most devastating on record. Much of the scientific analysis that followed the 2017 hurricane season focused on the role of climate—including the overall warming of the planet—in determining a hurricane’s physical strength and total amount of rainfall. Iowa and Princeton researchers decided to take a different, but complementary, tack and looked at urbanization’s possible role. The researchers experimented with different computer models to simulate Hurricane Harvey’s rainfall in Houston, first looking at total rainfall with the city’s current urban profile, then at rainfall for the same geographic area but with open fields and crops in place of streets and skyscrapers. They found that the non-urban areas received significantly less rainfall, and that rainfall patterns were significantly different than in the urban areas. The reason was that “surface roughness” due to the presence of man-made structures create a “drag effect” on hurricanes. This effect occurs when high winds strike tall buildings, creating friction. In the case of Hurricane Harvey, winds shifted warm surface air farther up into the atmosphere, thereby creating an optimal situation for cloud formation and precipitation. The researchers also found that as Houston’s urban center grew upward and outward, flood risk also changed, including a greater risk of higher flood peaks and more serious and dangerous flooding overall. As the city’s miles of impervious sidewalks and streets increased, heavy rainfall could not be absorbed into the ground. Using statistical models, researchers looked at year-over-year changes in flood peaks and compared them to rainfall amounts and population growth, a proxy for urbanization. They compared these results to flood peaks from the 1950s, a period that predates urban development in Houston, and again found a positive correlation between urban growth and increased flood risk.